As we get closer to our boat decision, we decided to take advantage of the Sea-Doo Life Test Ride Tour as the first stop was in our local area. The tour gave us the opportunity to get out on the water in one of the Sea-Doo boats, a 210 SP. The 210 SP has a lot of cool features in 21-foot package. I especially liked the layout of the cockpit, the double bucket seats are nice and I plan to claim one of them if this is the model we decide on! I can already hear the calls of “shotgun” and arguments of who gets the second best seat on the boat-maybe I will have my name embroidered on this second cockpit seat! We took the whole family along for the test ride as we would be enjoying our time on the water with everyone and always will have friends or family in tow. The 210 SP has seating for eight adults—my boys are already approaching adult size so we all five fit nicely into the 210 SP with room to spare for friends and family. The maneuverability of this boat is outstanding! I have heard many people discussing the benefits of stern drives vs. jet drives and, as a new boater, I find the jet drive very simple to maneuver and operate. The iTC controls (intelligent Throttle Controls) are great features. One of my favorites is Eco Mode. The cost of a day on the water is important to me and this feature will help us save gas and ensure the boat is operating at the most efficient speed for our touring. 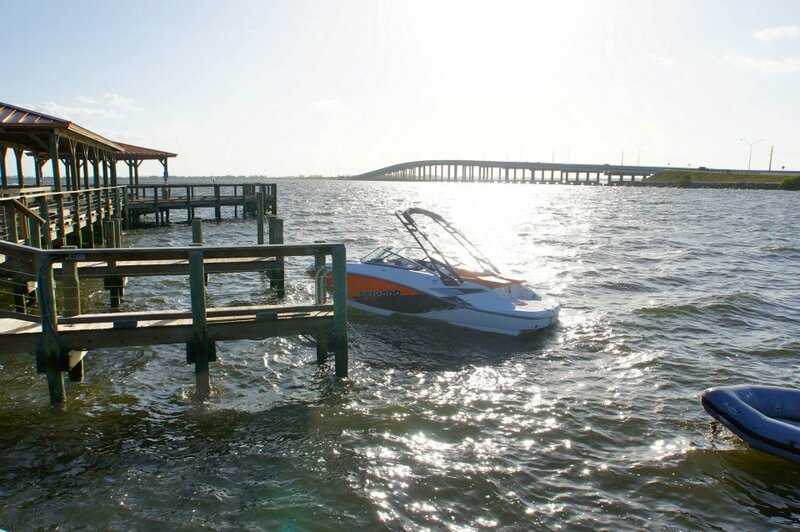 Most of our rides will be on the Indian River and there are hundreds of islands to explore and great on-water restaurant destinations to visit. One of our primary destinations, the Sebastian River Inlet, is about 45 minutes away by car. On busy summer weekends hundreds of boats will stop on the sandbar and enjoy a big boat party—really looking forward to being able to join them! My plan is to chill in the Transat seats and enjoy the view! Docking mode is another HUGE feature. One of my biggest concerns is learning how to dock and trailer the boat. My husband has many years of on-water experience, but the rest of us are still novices! Just the stress of trying to load or dock at a busy ramp/marina gives me angst. This feature makes it so that, even I, could dock or load the boat by lowering the power delivery system. Even if I made a minor mistake (accelerated too quickly or whatever) Docking Mode makes it so that the power is limited to 3500 RPM for easier handling. My kids were very concerned about the ability to tow them on wake boards and in an inner tube. The SP has an Arch Tower with a bimini top that keeps the wake riders up on the water. The prop-less drive will help me relax (in those cool Transat seats) while the kids jump off the boat or get back on after towing. We also have a few low bridges to maneuver on our way out to the River; the ability to easily lower the tower will be a huge feature. The closed loop cooling system is also a strong selling point to me. All Sea-Doo boats have this feature and will help me protect my investment by not cooling the engine by outside water. Our rivers all run into the ocean and the salt water damages EVERYTHING around here. I feel confident that a Sea-Doo boat will help me alleviate the potential salt-water damage. Overall, taking the Sea-Doo SP 210 out for a spin helped me get the true feel of the boat and the features that are important or will become important to me, and my family, to help us enjoy our time on the water. The Test Ride Tour is continuing in many markets throughout the US through the beginning of August. Check out the dates and markets by visiting www.seadoodemo.com. The Sea-Doo 210 SP ready to take us on our Test Ride! Taking baby steps but each one gets us closer to being able to spend all of the time we want out on the water…..